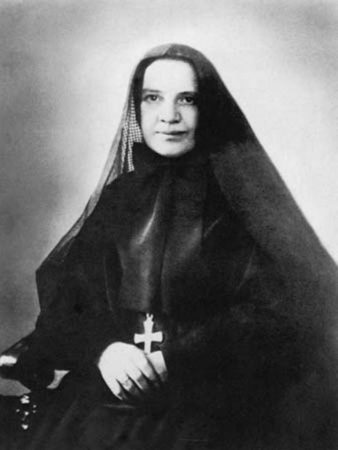 Born in Italy in 1850, Frances Xavier Cabrini is the first American to be canonized. She was the thirteenth child of a moderately prosperous Lombardi farmer. Having run an orphanage in northern Italy for three years after becoming a nun in 1877, she founded the Missionary Sisters of the Sacred Heart of Jesus. Her intention was to do missionary work in China, but Pope Leo XIII requested that she travel to the United States to minister to Italian immigrants. Frances arrived in New York in 1889 and immediately began to open orphanages and other institutions, both hospitals and schools. Her first orphanage, the St. Cabrini Home, was in Ulster County. She became an American citizen in 1909. Her work was never restricted to the United States. She traveled widely across Central and South America as well as making numerous return visits to Europe. In all, she oversaw the opening of sixty-seven institutions. Although her constitution was very frail, her spirit was endowed with such singular strength that, knowing the will of God in her regard, she permitted nothing to impede her from accomplishing what seemed beyond the strength of a woman. Located in northern Manhattan, St. Frances Cabrini Shrine overlooks the banks of the Hudson River and the neighboring state of New Jersey. 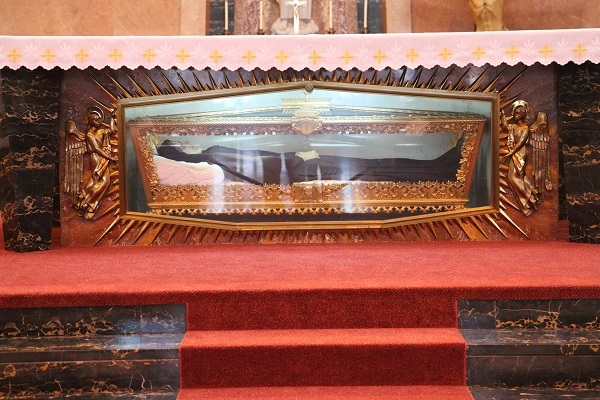 The Chapel houses the most precious remains of St. Frances Xavier Cabrini. After her death in 1917, Mother Cabrini was buried in West Park, New York. In 1933, her remains were moved to the chapel of Mother Cabrini High School. Following Mother Cabrini’s canonization in 1946, there were so many pilgrims coming to pray that a new shrine was built in 1957 on the grounds of Mother Cabrini High School. Today, the Shrine continues as a center of welcome for new immigrants and pilgrims of many nationalities who come to pray and reflect. Also, the shrine serves the young women attending Mother Cabrini High School as a place for their liturgies and special prayer services. It is a place where they can go to rest and be nourished.